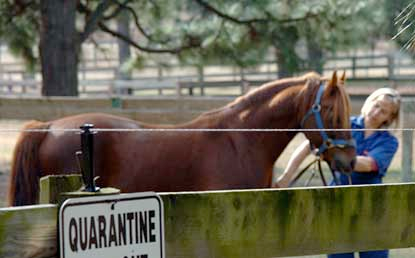 A good biosecurity program is important to protect your horse from disease. The following are some protocols you can implement to keep your horse safe. Talk to your veterinarian about biosecurity on the farm, and ensure you have a plan set up for emergencies. – Ensure your horse is up to date on vaccinations and Coggins. – Do not allow any nose to nose contact between your horse and other horses. Select a stall where your horse will not be in contact with other strange horses, choose a tack-stall strategically to isolate your horse! – Monitor your horse closely for changes in attitude, manure consistency, temperature, or any other change. – Ensure all horses on the property are up to date on vaccinations and Coggins. – Isolate any incoming horses for 2-3 weeks (i.e. no nose-to-nose contact). This will prevent them from spreading disease to others before they show any clinical signs. – Ensure each horse has its own buckets, grooming tools and feed buckets. No sharing! – Keep the end of the hose out of buckets when filling so it does not become contaminated with dirty water. – Have materials ready and work with your veterinarian to have a (written) quarantine plan in place! Be ready the moment you suspect your horse may have an infectious disease! – Quarantine the sick horse immediately. – Clean and disinfect all equipment and tools which have been in contact with the horse (including muck tub and muck fork). Ensure the sick horse has its own tools and equipment. After the horse has recovered, clean and disinfect all tools again! 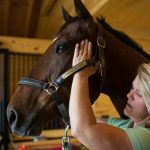 – Have hand sanitizer and a shallow basin to disinfect shoes available to use after touching the sick horse before coming into contact with the healthy horses. 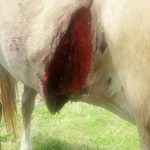 – Call and work with your veterinarian to set up a plan specific for your horse’s disease. Some diseases are more contagious than others and will require more intensive biosecurity protocols.